Wow, this report says everything that the Peak Oil Folk have been saying for the past decade! 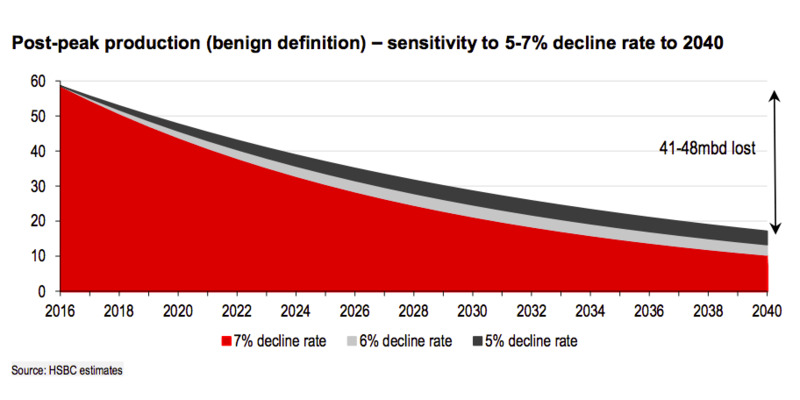 5-7%/Yr decline compounded will be a disaster. My Guess, we will try and frack the rest of the world next. If successful that will delay the end for 5-10 Yrs, with 10x the disaster. Lets hope that doesnt happen. Beware of stable dynamic complex systems becoming UNSTABLE dynamic complex systems due to feedforward of one or more components within the system. Define Stable: as moving in a direction of known consequences. Therefore Unstable as moving in a direction of unforeseen consequences. Define Dynamic: as free to move in any direction. Define: Complex: as a system made of many interacting subsystems each separated in time. Define System: as Weather. Fire. Political. Financial. Energy supply. Fill as you please. Define Feedforward: Sub systems become shifted in time by different rates. Therefore becoming out of phase with each other. What say DtheM readers to this rule? It’s a good thing you can drive from Brisbane to Melbourne on Tesla super-charger stations then. “Oh, but Eclipse, those batteries just don’t have the ENERGY DENSITY of oil!” And my answer 12 years ago? They don’t NEED IT! NOBODY needs cars…….. but we sure need trucks. And what if you want to drive from Brisbane to Cairns…………? And what if the roads turn into disrepair from lack of bitumen and money…..? Or… what if China buys up all the big Cobalt deposits and Tesla simply can’t produce enough batteries competitively? Maybe Elon will just start smuggling it directly from “Artisnal” (I just love the use of this word) children miners of the Congolese? Lithium Batteries… what a fantastically clean, green, ethical technology! Eclipse, you’d be a lot more persuasive with your important information from the “other side” if a) You weren’t always on the one side as if you are an ideologue, and b) You didn’t often try to distort the conversation by deploying a logical fallacy. You know as well as anybody that driving cars, is just one aspect of our energy consumption, and our supply predicament. I will read your reply but will not engage when you try to draw me in with more fallacies, ad hominem attacks, or any of the other tricks you routinely pull. If you haven’t already, check out Gail Tverberg – I think she has the best handle on what’s going on. Not so much peak oil but economic factors and energy factors and limits to growth factors merging to keep oil prices down and economies failing: Latest blog: http://ourfiniteworld.com/2017/01/10/2017-the-year-when-the-world-economy-starts-coming-apart/. I miss Fast Eddy there……………………………………………. We are looking at catastrophic, cascading, failure of a stressed, highly interrelated, very complex, system with no resilience (resilience is inefficient). So many factors, so many bullets out to get us, that it is impossible to know what will be the final trigger. Regardless of which theory of collapse you use, we are in the manure. Studies that give us ten years before collapse, are assuming everything will go as right as they can for ten years. Each year that normality continues is a surprise to me. Each October I expect the big financial crash and everything to spiral from there. But instead of Wall Street, it could start with Main Street or maybe an Occupy movement will morph into something else. A planned war might become something else or a solar storm at the wrong time. When does UNIX time run out? Peak phosphate is close. We are so vulnerable, far more vulnerable than any society before us. Everything societies before us needed, we need. But we need so much more, we are utterly reliant upon things that did not exist before. Will peak energy get us? Yes, if something else doesn’t get us first. This collapse will be quick. Relative normality to complete chaos within a week or so. Have you read “Last Light” a fictional novel by British author Alex Scarrow. It’s about the breakdown of society in London/England that results from a cessation of the flow of oil from the Middle East due to terrorism and civil war – yes, chaos in a week. A great read and followed by a second book set 10 years later. It’s quite a realistic scenario – no zombies etc. “One Second After” by Fortschen (?) is also a best selling book along similar lines, in this case following an EMP strike, which destroys the electricity grid. Again, a non sensational but disturbing look at what happens in a small town in the USA. Available on Audible too. Have not read either. (you don’t need to get bitten to turn a human into a zombie, just give him an I Phone.) Books ordered. At the same time a disruption of energy, economy and environment and more so should it happen at the same time could be a major shakeup. My guess is, at least in the short term, when the great disruption does come, the Aussie debt slaves will really feel the heat and soon after that that, the rich will get a whole lot richer. I like the ‘opt out option’ or what be called the collapse now and beat the crowd option. Speaking of collapse – diminishing resources, financial collapse, bee die-off, climate change, coronal mass ejection etc etc – what does anyone think of the information contained in Guy McPherson’s monster essay? You have his blog linked Mike. What’s your take? 10 years. Is he exaggerating? Btw, in his 2014 talk at Oxford in the U.K, he said that he had been contacted by Steve Wozniak of Apple fame, who asked him about relocating away from the USA. Guy advised him that the best places to be were NZ or Tasmania. Wozniak has since bought property in Tasmania (and mainland Oz) and become an Australian citizen. The vast majority of us will never know, civilizations collapse will take out 95%(wild approximation) of us. The aftermath of Toba reduced us to a few thousand individuals, the genetic bottleneck is evidenced in our DNA today. Yuval Harari credits the rise of man from just another African ape due the the development of the language of large groups, could Toba have been responsible for that language development. So many monkey spheres reduced to almost nothing, requiring new monkey spheres? Australia wide it is, our area (hunter valley) went from $1.05 to $1.25 in December, then up another 20 odd cents this week, so about 40% or so in a month. The increase of 20c is not uncommon but this time it stayed up and never varied (normally goes up 20c, down 5, up 2, down 5, up 5 etc for a couple of months) and then jumped 20cents again 4 weeks later. As you wrote crude is still down so trouble is on the way. 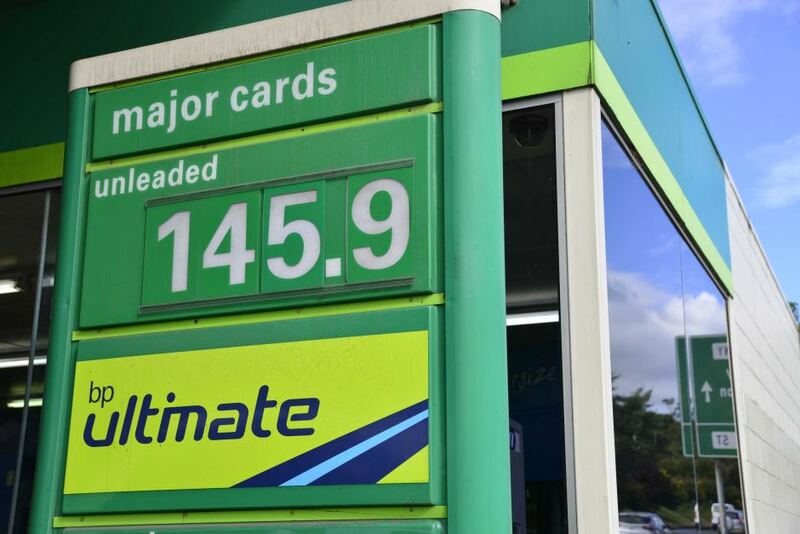 It’s been a couple of years since I followed up on that, perhaps this sudden price jump is due to our inability to produce even 10% of our fuel demand and maybe now we import the lot at exorbitant prices…….. the 2016 numbers should come out next month, watch this space.